People often ask me how I managed to take the idea for Build-A-Bear Workshop¨ and create the successful brand that it is today. I tell them that it started when I simply allowed myself to dream. I have always been a dreamer, and in 1971 when I graduated from University of Georgia, that dream was to go to law school. To save up the money, I started working as a retail trainee at a division of the May Department Stores Company. I quickly realized that retail was my calling and spent many years climbing the corporate ladder. I eventually became the President of Payless ShoeSource, and while the financial rewards were very high, my psychic income bank was nearly empty. I felt the retail business had not grown, focusing more on price than the customer. I wanted to re-energize the retail industry that had been so good to me. So I decided to leave corporate America and start a retail company of my own. These principles are bare necessities of any good business. I did not put restrictions on my vision, nor did I let the way others did business stand in my way. I was simply someone who wanted to pursue my passion. I wanted to bring the theater back to retailing. This is an idea I got from Stanley Goodman, former chairman of the May Department Store Company. During my third week on the job as an executive trainee, I heard Stanley give a speech. He talked about retailing as entertainment and the store as a stage. “When a customer has fun, they spend more money” he said. I remember his statement vividly as if he was saying it to me and me alone. This was a defining moment for me, and a concept that has stuck with me ever since. As a shopper, I certainly had fun when I was spending money, so the reciprocal made incredible sense. The success of Build-A-Bear Workshop in some part can be attributed to Stanley Goodman; this brilliant businessman helped me see that retail, entertainment and fun are really one in the same. The idea for Build-A-Bear Workshop actually came to me during a shopping trip with my young friend, Katie, who was ten-years-old at the time. It was the height of the Beanie Baby craze and we were on a mission to find a certain stuffed animal. The store didn’t have the one that we wanted and a disappointed Katie picked one up and said, “These are so simple, we could make these.” What she meant was going home to start a craft project, but I heard something completely different. When I first shared my idea for Build-A-Bear Workshop with others, there were skeptics who told me what I shouldn’t do. I listened politely, but didn’t let their “don’ts” stop me from creating what I knew could be a successful business. While I knew there would be risks, I took all the experiences that I had gained in my years in the retail business and applied them to Build-A-Bear Workshop. From working with some of the best people in retail, I learned that it is necessary to articulate your vision so that people can embrace and partner with you to help bring your ideas to life. Many adults questioned my business concept, but every time I discussed the idea with children, they got excited. It was this energy that propelled me to move forward with my business plan. I wanted every single person who walked into our stores to feel like it was the best day of his or her life, whether they were three or 103. This concept shaped the brand of Build-A-Bear Workshop. A brand is a promise your company makes and fulfills every day and our brand starts with the customer, whom we call Guests. We like to believe that Guests who visit Build-A-Bear Workshop stores are paying for the experience and really getting their stuffed animals for free. Our Guests are passionate about and feel ownership of our brand. At Build-A-Bear Workshop, our Guests are the heart of our business. They inspire us, they challenge us and they make us smile. Our consumer-centric focus is what makes us the company we are today: innovative, curious, successful and growing. Our Guests have come to expect a personal and fun experience every time they shop in our stores and they won’t settle for anything less. From the beginning, I wanted Build-A-Bear Workshop to be a fun place to play and work for our associates in stores and at our corporate office, which we call World Bearquarters. I knew I didn’t want my own business to function in the buttoned-up world of rules and dress codes. It needed a different personality, one that reflected my own outlook on life and the warm and fuzzy brand we were creating. The Build-A-Bear Workshop World Bearquarters, located in St. Louis, Missouri, is a bright and fun place to work where the brand values are carried out in everything we do. In 2011, Build-A-Bear Workshop was named to the FORTUNE 100 Best Companies to Work For list for the third year in a row. This is a distinction I am very proud of and hold as proof that the more fun people have, the harder they will work. I believe that good people, doing good work, with good heart, reap great rewards. That’s why I founded Build-A-Bear Workshop as a place where we could make a difference in every community in which we operate. For us, giving starts at home, so we have several programs to support fellow bears in times of need. In addition, we support causes that are important to our Guests such as children’s health and wellness, domestic pets, literacy and education, and the environment. Build-A-Bear Workshop has always been a company with heart and we have gotten where we are today by putting the fun and the heart back into retail. In 1997, the first Build-A-Bear Workshop store opened at the Galleria Mall in St. Louis, Missouri. Today, there are more than 400 Build-A-Bear Workshop stores worldwide, including company-owned stores in the United States, Puerto Rico, Canada, the United Kingdom and Ireland, and franchise stores in Europe, Asia, Australia, Africa, the Middle East, Mexico and South America. We have grown into the only global company that offers an interactive make-your-own stuffed animal retail-entertainment experience. Build-A-Bear Workshop includes make-your-own Major League Baseball¨ mascot in-stadium locations and Build-A-Dino¨ stores, in addition to new stores that have recently opened in special locations. The first Build-A-Bear Workshop store in a hospital opened in March 2011 at Cook’s Children’s Medical Center in Fort Worth, TX, and thefirst store in an airport opened in Orlando International Airport in May 2011. Build-A-Bear Workshop also extends its in-store interactive experience online with our award winning virtual world and entertainment destination,Bearville.comTM. By engaging Guests both in our stores and at home, we are building a top entertainment brand with endless possibilities for our business. 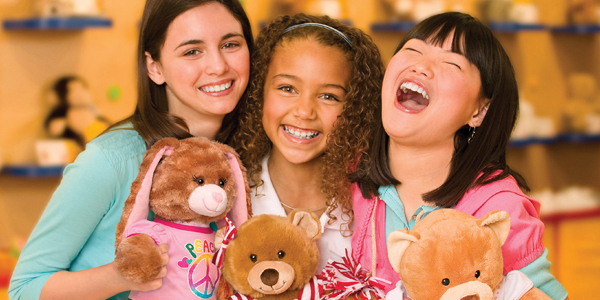 Our goal is to have a Build-A-Bear Workshop store wherever families go to have fun. That all started with a dream. In order to be successful, you must start by believing you can truly achieve whatever you set your mind to, no matter how monumental it may seem. My dream eventually came true, and continues to evolve beyond my wildest imagination. I love watching children make their bears and seeing their affection for and attachment to their new furry friends. I also love reading their letters about what Build-A-Bear Workshop and their stuffed animal friends mean to them. This is what being a brand means to me. It is a decision to let the outside world know about the inner workings and culture of your business. When you decide to become a brand, and not just a business, you create the guidebook for everything you do in the future. Build-A-Bear Workshop continues to follow that guidebook every day, and I wouldn’t have it any other way. 1. Start defining and building your brand from the very start. Your brand blueprint serves as a guide for every decision you make and every strategy you undertake. 2. Create a unique culture and language. For Build-A-Bear Workshop, this is our product names, trademarked in-store station names, and our Bearisms. 3. Pay attention to packaging. It is a very small incremental cost for the company but makes a huge statement to its customers. 4. Offer an escape from the ordinary. You need only to do things that aren’t standard in your industry and aren’t expected at your price point. 5. Offer Guests a consistent experience time and again. At Build-A-Bear Workshop, our Guests know what we’re all about and they trust us because we’ve earned their confidence through good service and honesty.